The biggest misconception across the roofing industry is that most materials can be applied when temperatures are below freezing during the winter months simply because the product label says so. This is not completely accurate. Only when the material is properly stored and maintained at or around 70 degrees fahrenheit does that point ring true. This means that the material has to be stored and maintained at or around 70 degrees fahrenheit before and during the entire application process to ensure proper mixing (when applying a two-part product) of material and substrate adherence. Even with a great crew comprised of veteran roofers that share decades of experience, you will have the common misunderstanding of material temperature and cold weather applications. Improper application of adhesives, sealants, roof coatings, spray foam insulation and primers often lead to unnecessary downtime and costly mechanical issues. We regularly receive material roof sprayers & application equipment during the winter season with requests for servicing becauase the machine stopped working due to improper material viscosity. The winter months bring freezing temperatures across a large portion of the country, which can cause problems - but even above freezing temperatures can wreak havoc on material applications & equipment; spray foam included. Two of the most common problems we see are shrinkage and poor adhesion to the substrate. One of the best ways to ensure proper application and consistent productivity from your crew this winter, especially during the colder months is to always start with a 70 degree product. Beginning the application process with a product that is stored and maintained at a temperature of at/or around 70 degrees fahrenheit is crucial to any successful application and maintaining a steady workflow of productivity throughout the entire duration of cold weather and freezing temps. SOLUTIONS: Roofing/Construction Material Application in Cold & Freezing Temperatures this Winter Season - For Roofing & Building Cavity Foam Insulation, Adhesives, Sealants, Coatings and Primers. Storage: Always make sure you store material at or around 70 degrees fahrenheit (60 to 80F) to ensure proper mixing, dispensing and rate of application. 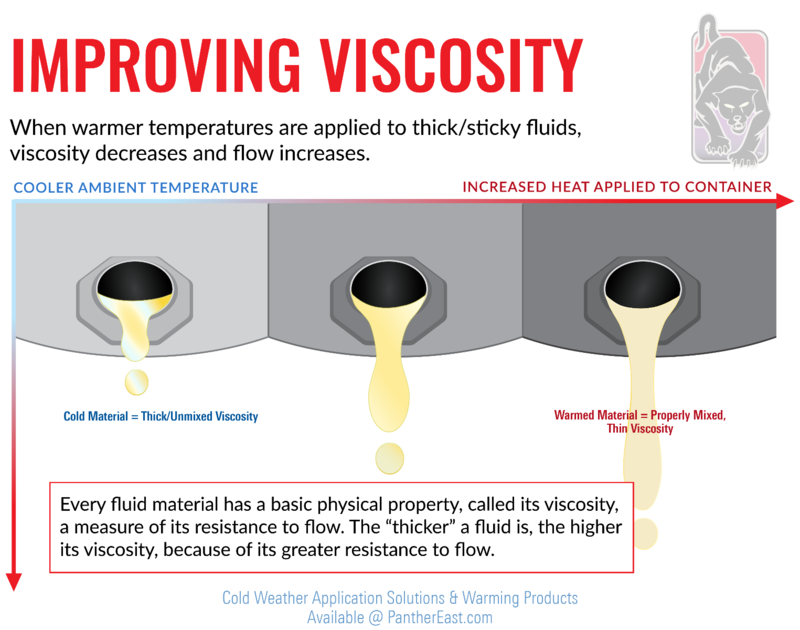 Maintain The Heat: Maintaining proper temperature throughout the entire application process is critical to your dispensing rate and productivity rate. Ensure consistent heating, dispensing, and productivity by using the exact Heating & Warming products that correspond to your material containers and application equipment. It is important to always use the correct size/fit and style warming product to heat your material and equipment. Some processes require that a thermostat is used for proper application. A lack of heat in a specific section of your material can result in improper mixing of a material, clog spray tips, nozzles, guns, and hoses or damage the material-to-substrate application capability, creating costly and unwanted results. 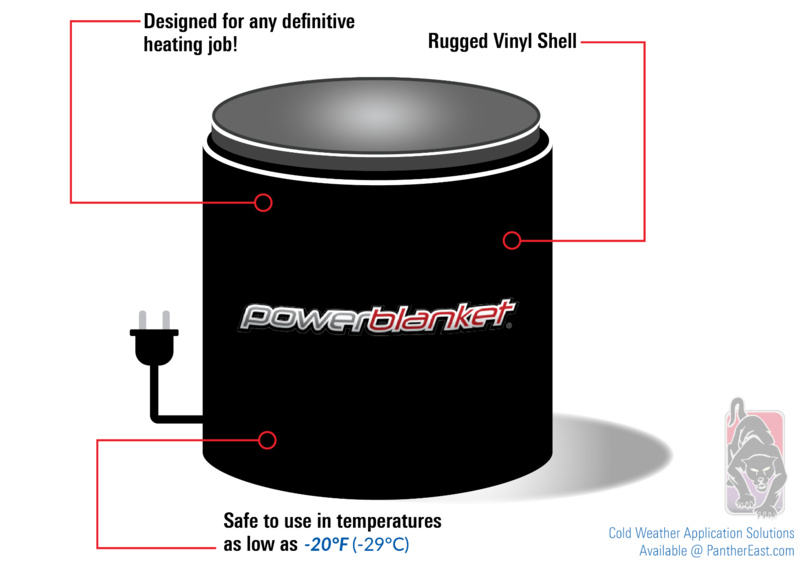 What to Use for Heat: There are specific heating & warming products for every piece of material application equipment; such as cylinder and tank warmers, barrel and drum wraps, heating blankets, heated foam hose sleeves, heated hose extensions, can and pail warmers, caulk warming bags and pouches, heating and warming blankets of varying sizes, hot box heaters with digital temperature control thermostats, and more. All of your warming and heating needs to get the job done right are available at Panther East with same day delivery available in most cases, and free delivery within a 60 mile radius to our location. 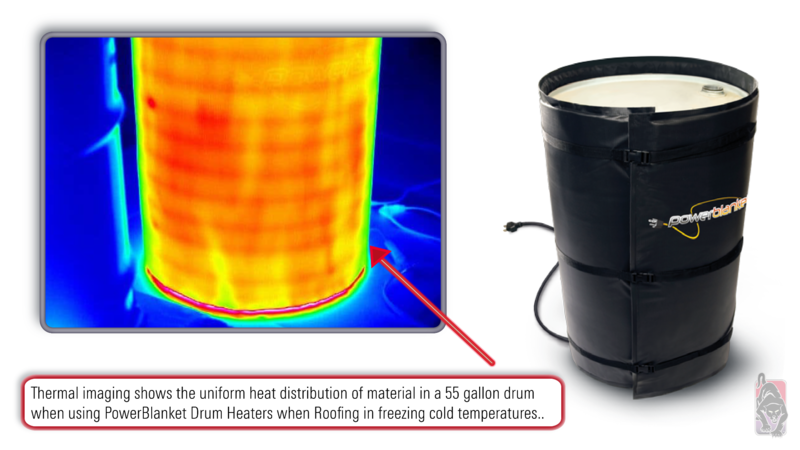 Additional Tips: It is very important to use proper heating equipment products when applying roofing materials. We have all heard the story of the guy you worked with on this crew or that crew (it may have even been you yourself) who used a homemade “intuitive” technique to heat tools and materials on a jobsite.. a torch kit, a truck engine, or maybe you even built a campfire right there on the job site to heat materials at the last minute. These last minute “intuitive” techniques have not only lead to improper application, having to re-do entire jobs and warranties being voided, but also injuries and property damage. Adding the proper heating equipment to your arsenal this season will save you time and money, helping you work through winter and increase productivity. One of the most common questions we get asked every winter - "What are the best material warming products for roofing adhesive, sealants, coatings and spray foam insulation?" Would you send your workers up on a roof in mid-winter with no clothes on? No? Why Not? - Because they would not be able to work efficiently, effectively, or safely! Don’t put your crew or your gear out on a jobsite this Winter without proper warmth and protection. 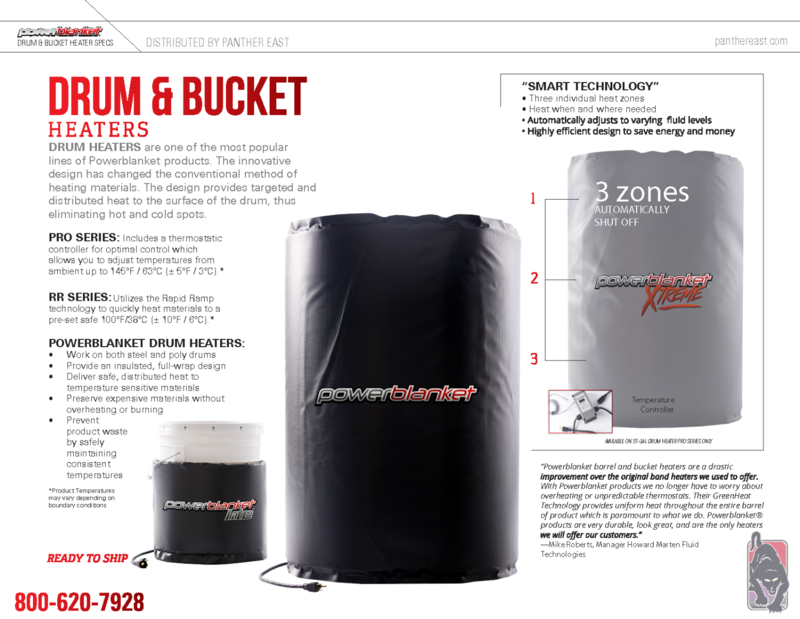 Get your Heating & Warming products from Panther East & Black Cat Fasteners this Winter season and stay productive and efficient!